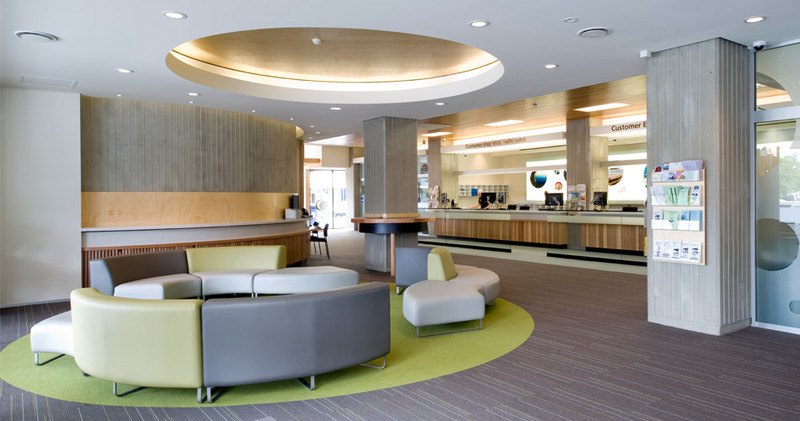 An extensive study of the existing Nelson City Council Civic House building complex was undertaken, to accommodate growth and improve the working environment and energy use. The study considered how to improve service, public interfaces and improve effects on urban design. The resulting interior fit out responds to the prominent circular clock tower base, exposed in the interior. The public space is an irregular space, characterised by the existing straight lines of the column grid and the curve of the drum containing the stair and lifts. The design concept plays with the juxtoposition of the straight-line and the circle, and reinforces these aspects. The customer service desk is a focal point, aligned in the central area with the straight line reinforced with the existing rimu ceiling and new lowered ceilings above the desks and waiting area. Elsewhere, the ceiling above the waiting area is organised with 'cut-outs' that contain acoustic absorption, lighting, and heating & ventilation services. These take a circular motif, reflecting the form of the stair tower, as well as being a shape that is adaptable to the irregular plan, adaptable to a number of purposes, and is both friendly and perfect. The circular motif is further utilised in a number of other elements, including the carpet, seating, the privacy film to office windows and to the light-wall behind the service counter. A simple, robust materials palette of timber joiner and exposure of the existing concrete is used, with colour obtained from the carpeting and light wall.